SUP is short from Stand Up Paddling. It is an emerging global sport with a Hawaiian heritage. The sport is an ancient form of surfing, and reemerged as a way for surfing instructors to manage their large groups of students, as standing on the board gave them a higher viewpoint. This increased visibility of what was going on around them such as incoming swell. There are hints that the ancient pacific islanders already used boards to ride waves and move on the water. According to that SUP was an early conjunction of the traditional Polynesian disciplines canoeing and surfing. With the invention of lightweight shortboards into the surfing scene, SUP felt a bit into oblivion but has recently been rediscovered. The nice thing about a SUP is that you don’t need an ocean and waves, you can also go paddling in flat water on your local lake or river. Sounds interesting. What equipment do I need? 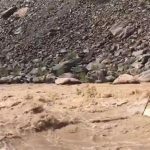 You will need a board, a paddle and „waterproof“ clothing (either wetsuit or boardshorts/lycra/bikini, depending on water temperature). For SUP Surfing in the Ocean or on River Waves, you should also have a leash, which connects the board to your leg so that you don’t loose it. A beginners SUP Board is typically at least 10’6“ long, so unless you have a van, you might need roof racks to transport it. Well, then you of course need water. Any local lake or river should do. 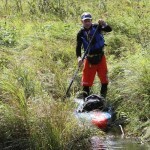 River Paddling can be tricky due to the currents, so it is advised to start on a lake, ideally on a day with little wind. Flatwater Paddling and SUP Surfing. Stand Up Paddling or Flatwater Paddling on Lakes and Rivers and SUP Surfing on Ocean or River waves. SUP-Surfing competitions are held in a similiar format as surf competitions with heats of 3-4 riders in the water at the same time and judges give scores for the best waves riden. 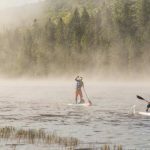 But now there are also SUP Races, where Stand up paddlers compete against other Stand-Up Paddler, last summer the Jever SUP World Cup took place in Hamburg, Germany, where hundreds of paddlers from all over the world competed against each other. In December, a very scenic race took place in Paris, France. Check out the event calendar. There are different disciplines, long distance races, relay races or short sprint races like the London SUP Sprint Challenge where paddlers competed against each other in a 120x30m indoor pool. 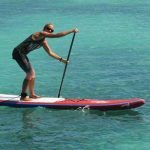 SUP – not only for men! SUP is easy to learn and a great way of spending time with your girlfriends. Check out here why SUP is the perfect sport for girls!